Are you looking to invest in real estate to earn considerable returns? Well, then you must definitely consider these 5 cities. Investing in real estate is always a risky proposition. Apart from the capital, a real estate investment also requires you to consider a number of other factors like the location of the property, how the market condition is, legal issues if any and so on. To make the entire process easier for you, we have compiled a list of top 5 cities that offer the best returns on your investment. Hyderabad witnessed a whopping drop of 30% in the number of new property launches in 2014, which resulted in realtors incurring huge losses. The drastic fall occurred because the emergence of residential projects in the city surpassed the demand. This fall has had huge repercussions on the real estate scenario in the city with the cost of properties reaching a new low. So, if your plan is to invest in a house the market’s volatility can work for your gain as you could practically buy a premium residential property at a cut-price deal. Once the market goes to self-correct mode, you can sell off the property for a great profit. 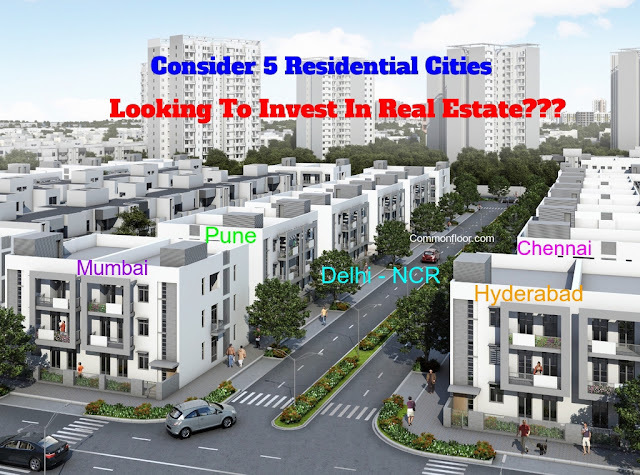 The economic capital of India, Mumbai is one of the hottest prospects when it comes to real estate investment. Although the city of dreams is considered to be highly congested, key areas like Bandra, Mulund, Chembur, Kanjur Marg, and Lower Parel offer a lot of profitable investment avenues. So, if you are considering investing in a residential property, Mumbai should top the list as the returns guaranteed will be unmatched. It comes as a bit of a surprise that several real estate experts and commenters are vouching for the real estate feasibility of Chennai. According to a recent research, Chennai’s real estate market has seen a constant appreciation over the last few years. The rental house rates have also decreased by about 9% from 25% to 16% in the last year alone. So make it a point to check out the investment options available in Chennai before you take any decision. Pune rounds off the Top 5 list of residential cities to invest in. Courtesy of the booming IT industry, the Maharashtrian city has welcomed middle and upper-class employees with open arms. With good infrastructure and affordable market rates, Pune promises to offer high returns on your real estate investment. With more and more IT crowd coming in, the government has also flagged off new civic infrastructure projects. So, this is your best opportunity to break your savings to get extremely high returns. These are the top 5 cities in India which currently offer the scope for high returns on your real estate investment. So, get your cheque books out and secure your future with a well-timed and carefully planned investment in these aforementioned cities. In case, you are looking to know more about the investment opportunities and base prices in these cities be sure to visit commonfloor.com.